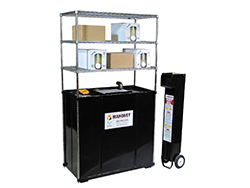 Mahoney Environmental® offers systems that automate the handling of used cooking oils. 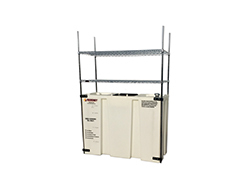 Our systems easily retrofit into most existing restaurants, are user friendly, improve safety, and provide benefits that drop right to the bottom line. 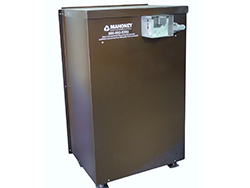 Our exclusive Direct Connection Recycler Systems permit used cooking oil disposal at the turn of a lever and a flip of a switch: the safest, simplest, cleanest way to manage used cooking oil. 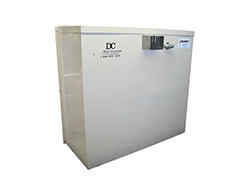 Hot used cooking oil is pumped directly from the fryer into the Direct Connection Recycler, positioned either inside your restaurant or outside in its own storage compartment. 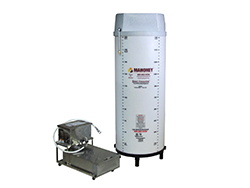 A portable filter machine can also be used if the fryers do not have built-in filtration capabilities. 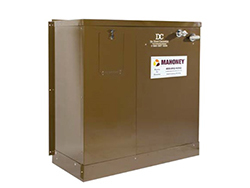 The Mahoney Environmental indoor system is designed for restaurants with available interior floor space. The holding tanks are installed inside the restaurant with a connection located on the outside wall. 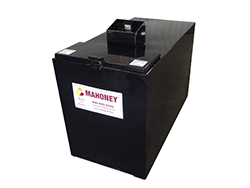 This insulated container is heated for use in handling liquid cooking oils and solid shortenings. A used cooking oil shuttle transfers oil from the fryer to this container. The fill opening is screened to secure the used cooking oil. The container can also be fitted for a remote reporting level sensor. The evacuation port is outfitted with an anti-theft lock. No more workers’ comp or insurance claims for those types of accidents. No more cleanup of grill buckets or a transport shuttle. No more danger from exiting the building to dispose of used cooking oil. No more smell or mess from an old grease container.